I’ve spent several days on the Iron Range enjoying the warm hospitality of my relations. The only drawback of being in that lovely part of the world is that the whole region seems a stranger to actual high-speed internet. Twice I found myself eating a truly mediocre lunch in a restaurant because they had wi-fi and I could check my email. 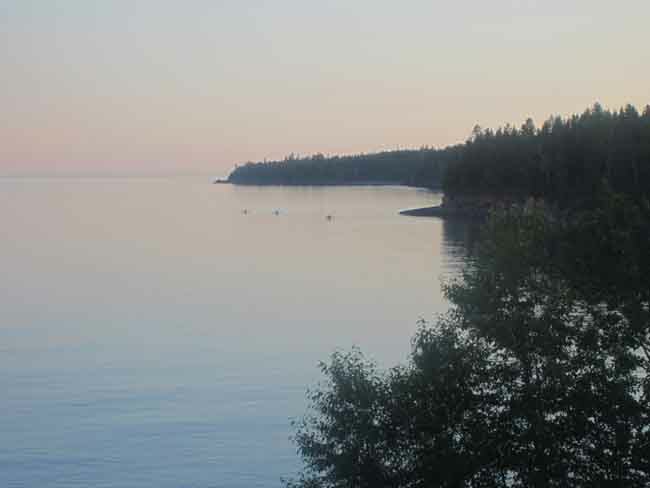 I’m now in a place on Lake Superior’s North Shore, with a wonderful lake view and a spotty internet connection. I shall range on, as soon as I’ve caught up on my sleep. Agreed. North Shore is awesome. Looking forward to seeing where your road trip leads next. Nobody goes to Cuba for either the internet connectivity or a foodie expereince. Meaning, unlike say, Mexico, Cuba not only does not have a world class cuisine, on the level of Mexico’s, it doesn’t have connectivity either, since it was left off the fiber optic cable grid at the insistence of the U.S.
It’s going to be interesting to see how the various members of the tour groups el V’s taking down in January and March deal with that. They’ve been clued in, of course. OTOH, a lot of people love losing the grid for much of the day. The nice hotels in Havana and Santiago have it, but it’s expensive. Outside these two centers, internet is a lot more iffy even in the very beautiful resort hotels along the eastern coast. Nor do your U.S. phones work. You need Cuban burners. In the past though, it seems the booze, the people, the music, the entire experience, more than made up for it. There are occasions when I very much enjoy being free of the internet’s electronic embrace, but this just isn’t one of those times. Work was impossible at home, and one of the reasons for the trip was to find some peace in order to write. And unfortunately I’m also an ebook publisher, so I’ve got to be online to do promotions and various sorts of upkeep and bookkeeping. So here I am, hoping for connectivity. Coincidentally enough, I just got an advertisement from a company offering me a scuba trip to “the virgin coral Jardines de la Reina” off Cuba. 250 untouched islands, it says here, in a protected marine environment. I’m tempted to go.